I have only one selection for Cheap reads this time around and that is Disease by M.F. Wahl. This is a six part serial that takes a look at life after the zombie apocalypse. When I first started reading this it reminded me of The Walking Dead because its main focus is on how human survivors change as they deal with the fall of civilization. It didn’t take long though to realize that the story for Disease is much better then The Walking Dead and I think this is how people would act when zombies take over the world. Disease begins after society has collapsed. The first characters we meet are a young woman named Casey and a boy named Alex who are on the run. You see how desperate they are as they explore a house that’s crawling with zombies. They battle the undead and get excited as they find an unopened can of dog food. Casey and Alex are slowly starving to death and a can of dog food is like a godsend, if there is a god in the zombie apocalypse. Things aren’t bad for everyone though, we also meet a woman named Lot who has started a new society in a hotel. Lot and her followers have everything they need and they started trading with other survivors that have set up their own communities. Lot’s hotel looks like a little utopia in this world where zombies rule, but not everything is as it seems. Meanwhile Casey and Alex meet up with a group of Lot’s followers led by Danny and it looks like they have finally gotten the help they need. The hotel for them is a blessing and a curse and they soon realize they may have been better off with the zombies. Because some people are bigger monsters than the zombies outside. 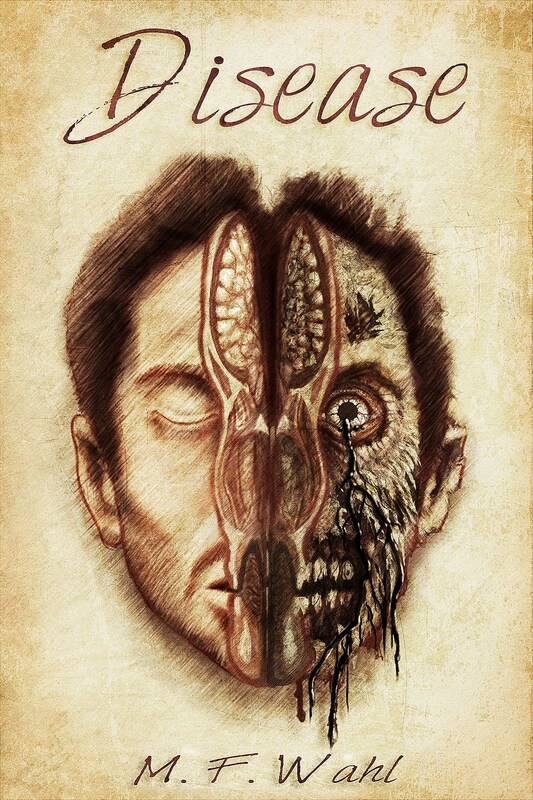 If you’re a zombie fan, Disease is a must read. M.F. Wahl describes her zombies in gruesome vivid detail. All the zombie scenes are so well described that reading it is like watching a zombie movie. One of my favorite scenes was towards the end as a freshly turned zombie rises out of a shallow grave but the scariest parts of this book don’t include the zombies, the people are scarier. One character in particular in this story is the physical embodiment of evil and the way the author shows how evil she is by using innuendo was brilliant. Only one person sees past the facade of the villain in the story but he has his own agenda. I would love to talk more about the story but I don’t want to give away any of the surprises. Disease is a fresh look at the zombie genre. I liked how the book had both fast and slow zombies and how some zombies were smarter than others. Most of all I enjoyed the characters and how each one of them is a shade of grey. They all have a sense of right and wrong but when it comes to staying alive, what is right goes out the window. Another thing I liked about this book is how unpredictable it was. There were four times while reading this book that I was shocked because something happened that I didn’t see coming and that’s what I like to see in a great horror story. Disease is the kind of book that I would show to someone when they ask why I like to read horror and I can’t wait to see what M.F. Wahl comes up with next.